Broadway Producer and Democratic Donor Releases Musical Number, "We're Coming To Take Your Guns"
“We are not saying we’re coming for your guns… WE’RE SINGING IT!” proclaims billionaire heir and Broadway play producer Jordan Roth in a preview video for what would be the next episode of his children themed web series titled “The Birds And The BS”. 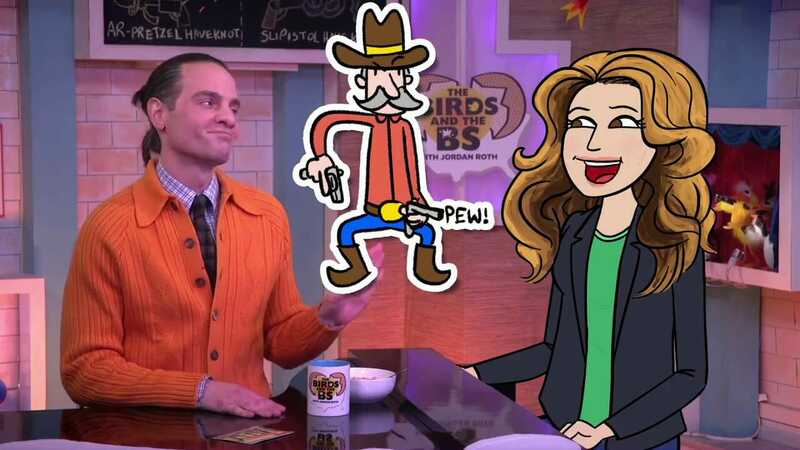 What followed was a bizarre Mr. Rogers-meets-showtunes rant about guns and the 2nd Amendment, with a guest appearance by an animated version of SNL alum Ana Gasteyer. The episode starts off with a facetious letter from a parent asking for advice about what to do if one of her kids chews gum irresponsibly and the other kid is a responsible gum chewer. 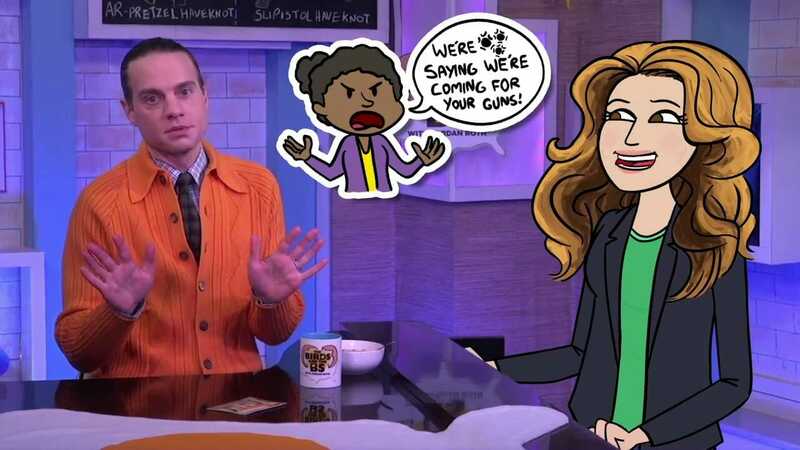 Roth starts to replace “gum” with “gun”, and the Ana-mated Gasteyer enters the scene to lecture everyone on why guns are bad. “Let me use an analogy to help with this one. Imagine for a moment that I am surrounded by people who play with their… GUN. With these people spitting bullets all over, would my mother still let me keep my gun?” to which Gasteyer singingly responds “OF COURSE NOT! It’s a fair point you make, this was not your mistake, I’m a law-abiding son, why take away my gun? 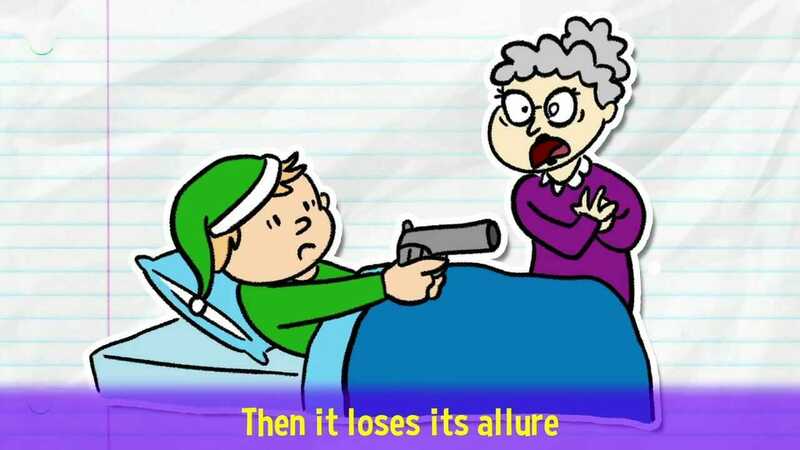 But as a mother in charge of your fun, the acts of another can ruin it for everyone… This is why we can’t have assault weapons, or, you know what, guns of any kind” as the Ana-mated Gasteyer takes guns away from other animated figures and tosses them into her purse. “So even though there are a lot of people who use guns responsibly, the “FUN” we get to have isn’t worth the destruction they cause?” asks Roth. “Exactly. You know there’s a lot of things we do that with,” says Gasteyer. They then go on about lawn darts, sudafed, and adopted animals, saying those things are harder to get than a gun. 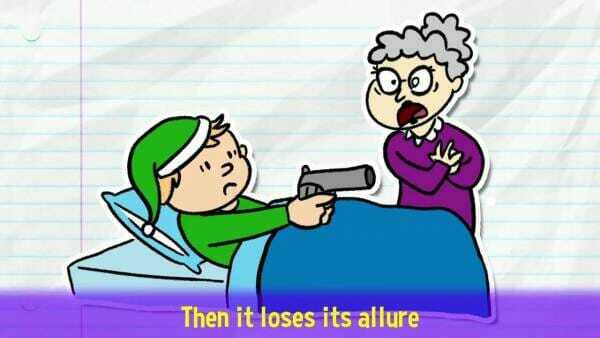 Gasteyer then says that if you sleep with a gun under your pillow, you’re going to shoot grandma, thinking she’s a burglar. 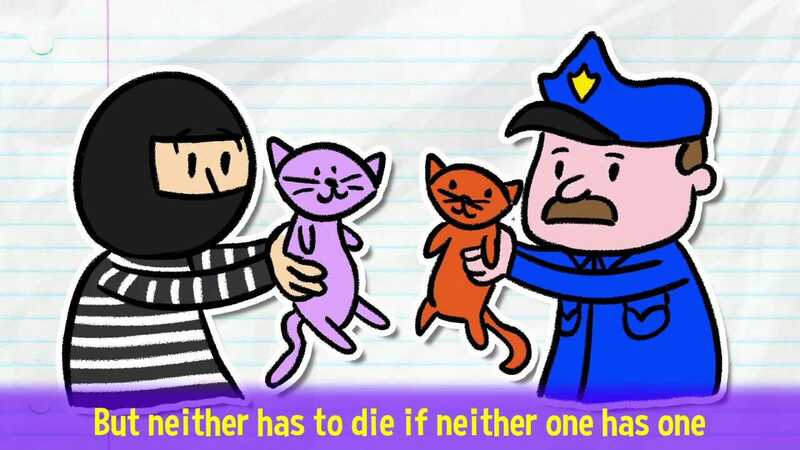 “They say a good guy with a gun, could stop a bad guy with a gun, but neither has to die if neither one has one” they sing, replacing guns in the hands of an animated robber and cop with kittens. Roth had previously teamed up with Harvey Weinstein to produce a star studded fundraiser for Hillary’s campaign in 2016. I suppose they want to make it easier for Weinstein to sexually abuse young women by disarming them so they can’t fight back. 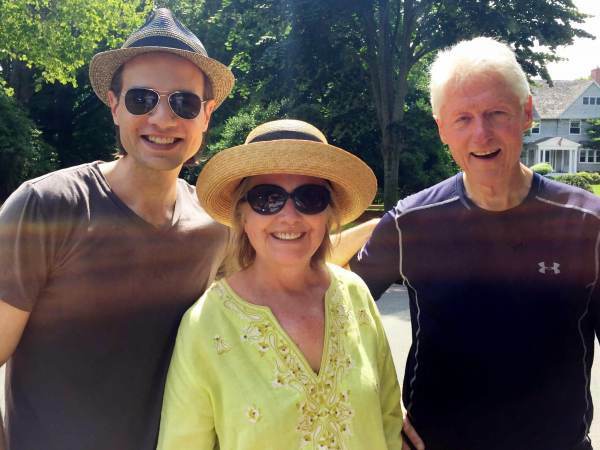 Jordan Roth with Bill and Hillary Clinton. If there’s one good thing that’s happened in the wake of Parkland, it’s that the mask is coming off for the anti gun liberals. No longer are they hiding behind the deceptive rhetoric of “We don’t want to take your guns. 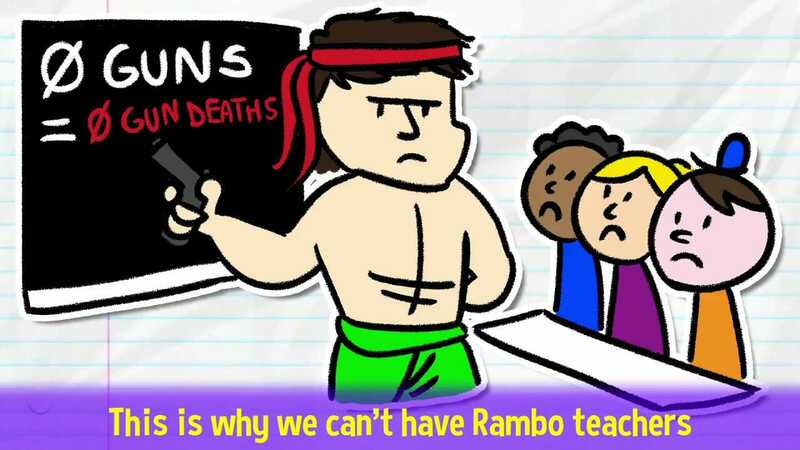 We don’t want to ban guns. We don’t want to repeal the 2nd Amendment. We support the 2nd Amendment. 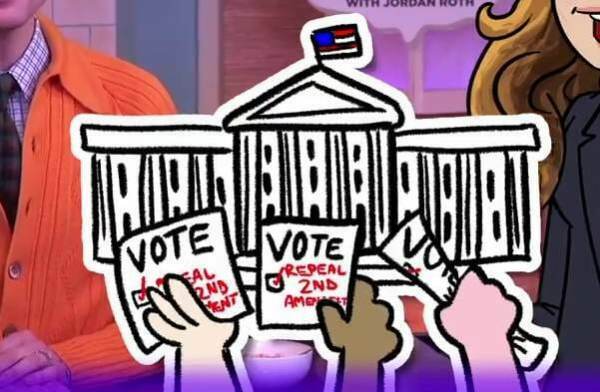 We just want reasonable, common sense solutions to gun violence,” and now they are outright saying they want to repeal the 2nd Amendment, ban all guns, and literally come to take your guns away. How? Well, they’re liberals, so of course they haven’t thought this one out very far.